trimmed brussel sprouts are cut in half and tossed with cubed delicata squash. 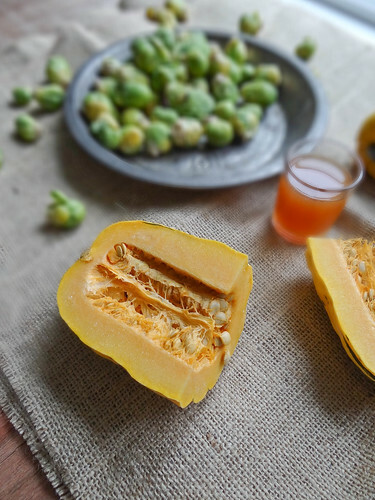 i love winter squash whose skin is edible - with the delicata you can simply cut in half, seed and cut into bite size chunks..
once you have your veggies prepped the sprouts and delicata are tossed with a mixture of fresh apple cider, maple syrup and french grainy mustard. 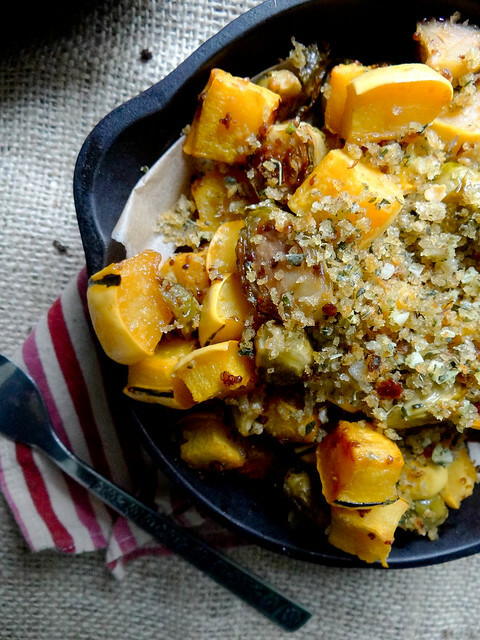 the whole mix is roasted until sweet and caramelized then topped with amazing homemade garlic herb bread crumbs. for thanksgiving these would be super adorable baked in little ramekins - perfect to assemble a few days in advance then reheated for thanksgiving dinner. for my american friends, have you begun planning your menu for thanksgiving day? what is your favorite part of the holiday season - do you have a favorite holiday that you go over the top? 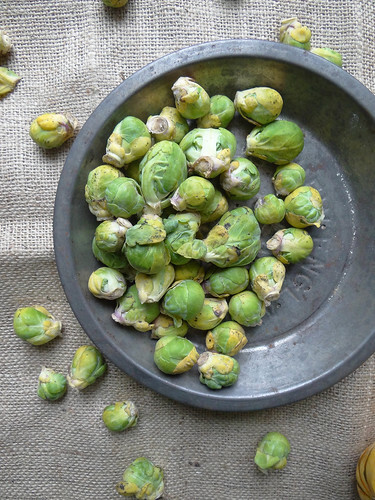 prep brussel sprouts - trim bottoms and remove any bruised outer leaves, cut in half & place on a rimmed baking sheet. scrub delicata squash of any dirt - cut in half & remove seeds and cut into cubes.- place on baking sheet with brussel sprouts. 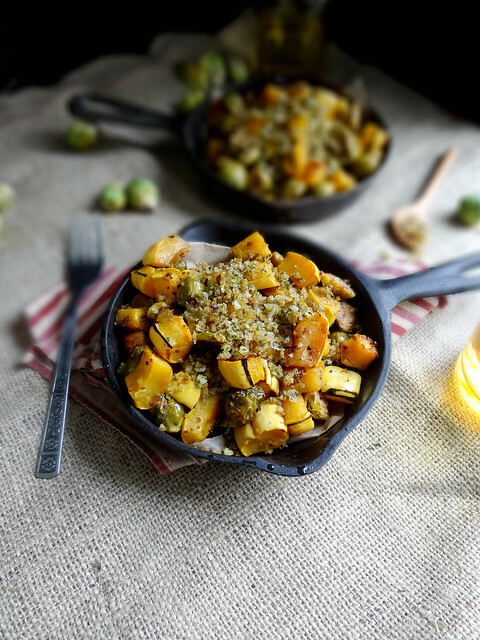 in a small bowl whisk apple cider, mustard, maple syrup & canola oil - drizzle over brussels and squash and toss until all pieces are coated & sprinkle with salt. roast in a pre heated oven for 35-45 minutes. mean while prepare bread crumbs - toast one slice of bread and process into crumbs in a food processor with thyme & oregano. mince garlic - heat a medium saute pan over medium heat, drizzle with olive oil and add garlic & herb bread crumbs. cook until bread crumbs are golden brown. 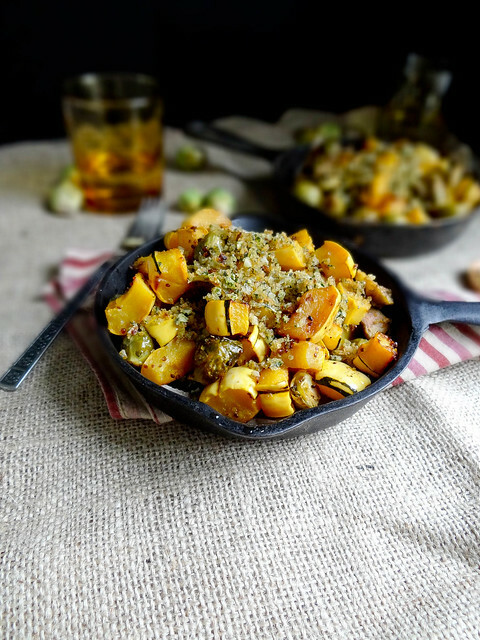 to serve - place roasted Brussels and squash in a serving dish and sprinkle with bread crumbs. can be made a day in advance an reheated in a 350* oven for 15 minutes. i LOVE roasted brussels sprouts, too! they are seriously candy to me. this dish sounds fabulous for thanksgiving! there are so many things i want to make, but this definitely tops the list. i think i might be using these bread crumbs on everything. i bet they take the roastes squash and bsprouts to a whole new level! gorgeous pictures heather! 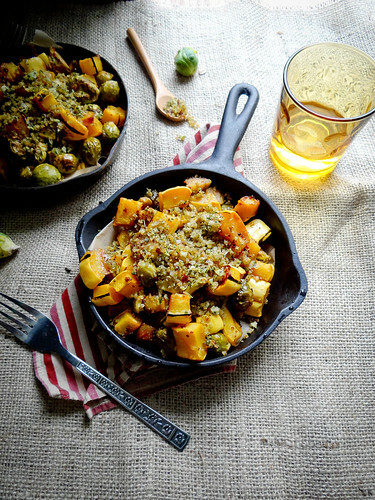 This looks amazing, roasted sprouts are soooo good. This will be on my Thanksgiving table! 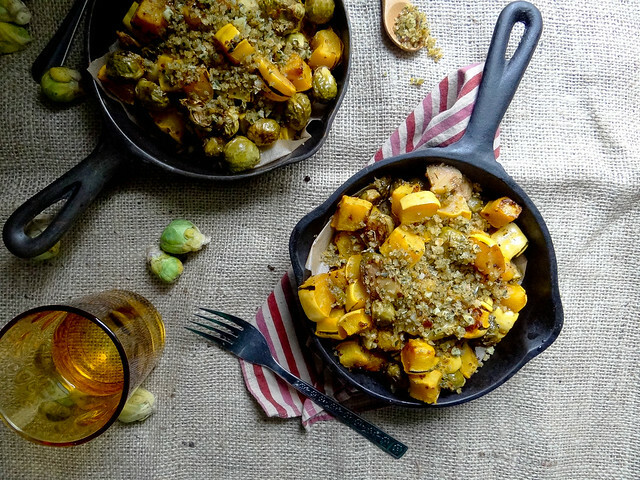 !..LOVE brussel sprouts!..American, yet paleo, is there an acceptable alternative to the bread crumb dilemma? !..I want to do this creation justice!! Thanks for stopping by :) a great alternative would be choppped pecans, toasted and tossed with a bit of maple syrup - you could also chop up some apple, saute with a bit a maple syrup until sofy and caramelized and toss with the toasted pecans - that would be amazing too! Let me know if you make these and what topping you ended up using! 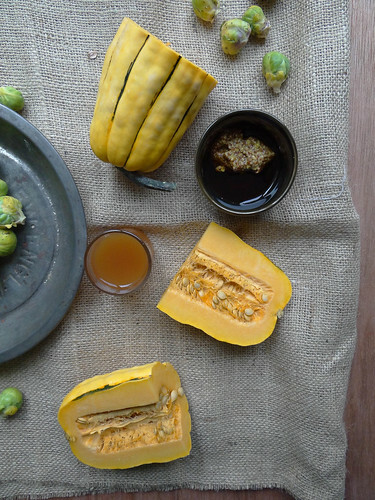 Let's start a new saying: "That goes together like squash and brussels sprouts!" OK? Heather, I didn't like brussels sprouts until earlier this year, when I finally tried them roasted! I love this combination. I can only imagine how glorious your thanksgiving table will be! I totally agree with you about brussel sprouts. I can't get enough of them! My (super picky) 5 year old niece is equally in love with them, so this recipe might just be included in our Thanksgiving meal as well. Looks delicious! 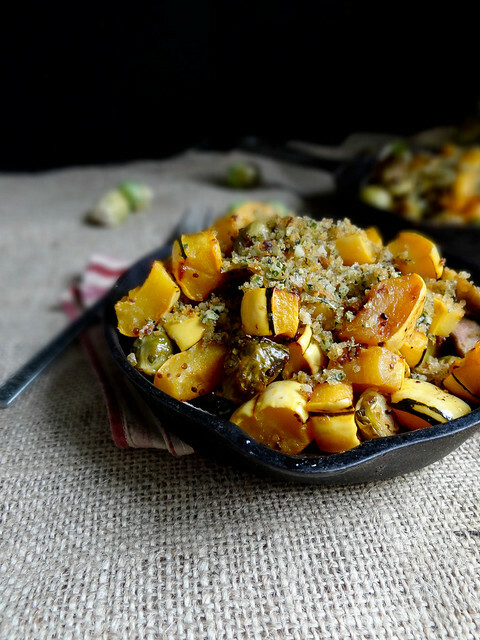 I love all the Fall flavours going on in this dish. 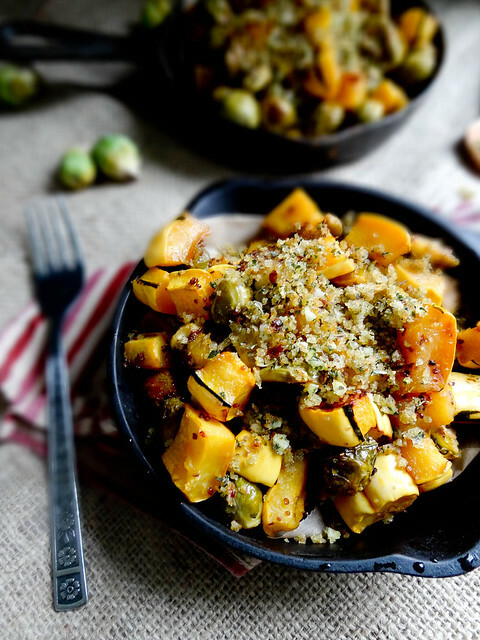 It sounds like exactly the kind of dinner I would make for myself on a typical weeknight these days, except I wouldn't have thought of adding seasoned bread crumbs - sounds perfect! this looks amazing! I never liked brussels until I tried carmelizing them. They are sooooo good. Beautiful idea for Thanksgiving! This sounds amazing! I love your photos. Sounds perfect to me! I love brussel sprouts... sometimes I just saute them with a little garlic and lemon and eat them straight out of the pan! I love the idea of maple syrup and mustard, though, will have to give that a try.